Borobudur, or Barabudur, is a 9th-century Mahayana Buddhist monument near Magelang, Central Java, Indonesia. The monument comprises six square platforms topped by three circular platforms, and is decorated with 2,672 relief panels and 504 Buddha statues. A main dome, located at the center of the top platform, is surrounded by 72 Buddha statues seated inside perforated stupa. The monument is both a shrine to the Lord Buddha and a place for Buddhist pilgrimage. 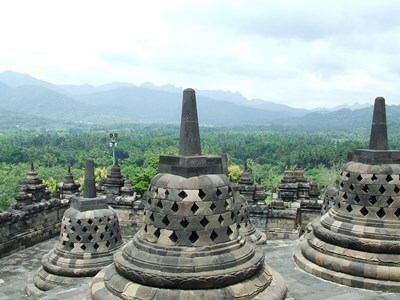 This description uses material from the Wikipedia article on Borobudur and is licensed under the Creative Commons Attribution-ShareAlike License (view authors).